A huge earthquake in Chile in May 1960 created a tsunami that killed thousands of people and sent waves across the Pacific Ocean, with effects felt as far away as the Philippines. The earthquake was the largest recorded on modern-day seismometers  and should not have happened when it did, according to seismologists theories on earthquake cycles. Earlier notable events, though smaller, should have released stress being stored on the Chilean fault. But new research documenting tsunami deposits in the region is resetting the seismic clock. Researchers in Chile used soil profiles to check historic earthquakes, reported by Spanish conquistadors and local settlers, to see how they fit with the regions devastating 1960 earthquake, the largest ever recorded, at magnitude 9.5. Image courtesy of Marcos Cisternas. The Nazca plate dives underneath the South American plate, creating a subduction zone several thousand kilometers long, and a huge fault line where the plates converge. Four major earthquakes within the past 250 years were greater than magnitude 8 according to the historic record, and presumably released quite a bit of stress from Chiles subduction fault. Seismologists thought that an 1837 earthquake in particular, which generated a tsunami that washed ashore Hawaii with a 6-meter-high wave, was large enough to have relieved some of the tension on the fault. But the 1960 earthquake measured magnitude 9.5, rupturing 1,000 kilometers of the faults length  an event that came as a complete shock. The conundrum puzzled seismologists: 123 years clearly was not enough time to build that much stress on the Chilean fault. To address that problem, a team of researchers led by Marcos Cisternas of the Pontificia Universidad Católica de Valparaíso, Chile, searched for evidence of how big the previous earthquakes were. They documented signs of about a dozen earthquakes at sites along Chiles south-central coast, particularly noting tsunami deposits, and checked written reports of shoreline changes or subsidence made by Spanish conquistadors and later settlers. In some cases, such as a huge 1575 earthquake, the team found evidence for local tsunami events. But for the substantial 1737 and 1837 earthquakes, no tsunami evidence was found in local Chilean deposits, according to the research published in Nature on Sept. 15. This absence of evidence has implications for the nature of magnitude-8 earthquakes versus magnitude-9 and higher, and for the earthquake cycle of subduction zones such as Chiles  similar to the Sumatran fault that set off the Indian Ocean tsunami last December, and with some parallels to the Cascadian subduction zone in the Pacific Northwest. Stress building on that part of the Chilean subduction zone needs about four centuries for incubating a giant earthquake, Cisternas says, leaving that part of Chile relatively safe for now. In Sumatra, for example, people were very surprised by the magnitude-9-plus earthquake that struck last December, he says. A magnitude 8 would have been unsurprising, judging from the last big earthquake there, about 120 years ago  coincidentally the same as Chiles seismic history. But as more extraordinarily large events occur and are documented, expectations have been slowly changing. For example, as scientists further elucidate the Pacific Northwests seismic and tsunami history, Nelson says, they continue to reevaluate the seismic hazard for the region. Another conclusion drawn by Cisternas team is that magnitude-9 events on subduction faults occur on separate but parallel cycles from magnitude-8 earthquakes. Cisternas suggests that this evidence could change geophysical models of subduction fault zones. But Hiroo Kanamori, a seismologist at Caltech in Pasadena, Calif., says that the seismological community has long known that earthquakes do not unfold like clockwork. Any sequence cant be very regular because dynamic relations between different patches create chaotic event patterns, Kanamori says. 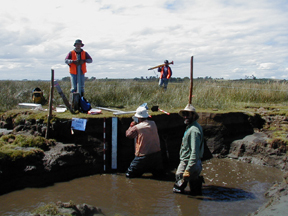 The main value of the new research, he says, is that it provides solid field evidence finally confirming suspicions that the 1837 earthquake did not have as much of an impact on the fault as the historic record indicated.